Air Force Veteran Fired Under DADT Named As Inauguration Citizen Co-Chair - Joe.My.God. “This is certainly the honor of a lifetime, and I am grateful to President Obama for his leadership in repealing ‘Don’t Ask, Don’t Tell’ so that no qualified American who wants to serve this country in uniform will ever again be denied that right simply because they are gay or lesbian,” said Hall. Hall will join the seven others named today in the National Day of Service on Saturday that kicks off the inaugural events over the Martin Luther King Jr. holiday weekend. He will attend the swearing-in ceremony Monday and along with the other co-chairs will ride on an inaugural parade float highlighting the inaugural theme of “Our People: Our Future.” Monday evening, he will attend the official inaugural balls. 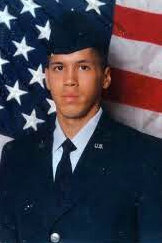 Hall served in Saudi Arabia and Kuwait before his discharge.